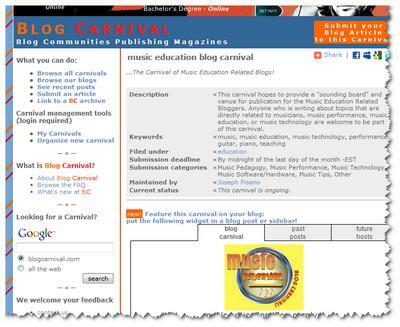 If you’ve missed it -we decided to bring back the Music Education Blog Carnival. If you are a blogger and have a post that you would like to submit to this month’s Music Education Blog Carnival –Now’s the Time! The current plan with the Music Carnival is to have two more Music Education Blog Carnivals after this one postas and re-start next school year for a new season of Blog Carnivals. So far, entries have been sparse and littered with a number of SPAM entries (despite Blog Carnival’s SPAM Filter). Let’s keep this Carnival Alive -Submit today. PLEASE RE-TWEET THIS and RE-POST!